This item is an image. It was created by an unknown creator on or around the date published: 1950. 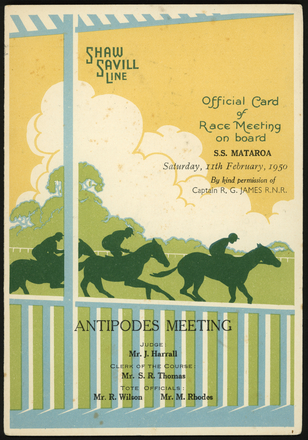 "Official card of Race Meeting on board S.S. Mataroa. Antipodes Meeting". Held February 11th, 1950. By permission of Captain R.G. James R.N.R.